Solution Saddles Customer Stories: Welsh Section D Mare & Her Success with Using Solution Saddles - A Story From The Archives. 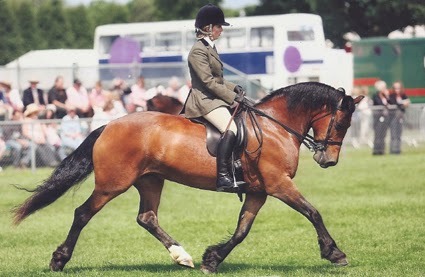 Welsh Section D Mare & Her Success with Using Solution Saddles - A Story From The Archives. “I have owned my Solution Saddle since January 2006. D that I have owned for 6 years. She used to be very tense, short striding and almost uncontrollable in canter and whilst jumping. It wasn't until I had a test ride with Solution Saddles that the true extent of her back problems came to light. I had her checked by a different osteopath who discovered that she had injuries consistent with having fallen over on a treed saddle. It was about 2 months before I could begin riding again and I immediately saw a change. Using the Solution saddle has obviously helped no end, as it had no rigid parts at all. At home we are now working at elementary level and doing county level showing. These are both things that I would never of dreamed of doing previously, as it was a regular occurrence not to even get into the showing ring after a rearing fit!! Whilst she is still very sharp whilst jumping, I don't end up on the floor quite so often … we got there in the end! !